And so begins a fateful conversation I’ve had dozens of times over the years. 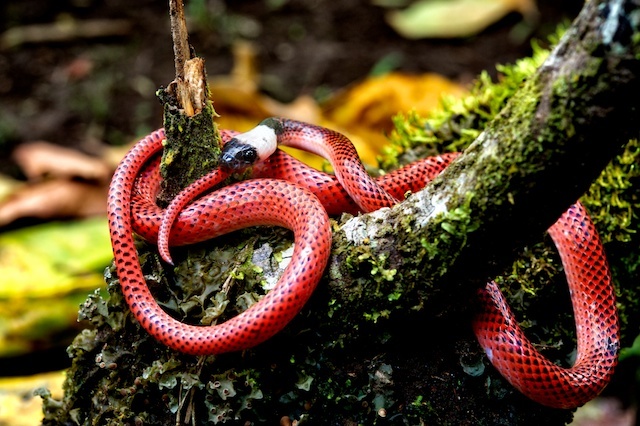 And for the longest time it continued this way: I would explain that there are many dozens of species of snake in the region, many of them cryptic and secretive, and that despite myths to the contrary seeing snakes in the Amazon basin is no easy feat. With lots of effort and skill one can ‘hope’ to catch a snake a day. That’s a good rule to start. Your average ecotourist might catch a glimpse of a snake or two during a long visit. No! Vipers, boas, and anacondas are not dripping from every vine, lurking like certain death behind every tree. Catching snakes is a tough business. Many are small; not bigger than a long pencil. And then there’s the common snakes; your parrot snakes, tree boas, blunt-headed vine snakes, and a few others that make of the bulk of my finds. So reality is that after a couple or so weeks of intense hunting the forests I’m left with a couple or few new species, or something less common that I catch maybe every few trips. I’m searching for needles in haystacks. Now at this point my conversationalist is glassy-eyed and wondering why did he even bother speaking with me. And you’re wondering why are you reading this piece. Well, I eventually do get to the answer. Yeah, I want a bushmaster. It’s the world’s longest viper. They have large fangs and can deliver large amounts of potent, very potent, venom. The Genus Lachesis is named after one of the Greek sisters of fate. Lachesis determined your thread of life; longevity and fate. This snake is uncommon, or rare. It is an apex predator in the forests but it, like the Sister named after, a bit of myth. The Amazonian species, Lachesis muta, evokes the name silent fate (or death), but even this is dramatized as the silent epithet refers to the lack of a rattle. They are said to follow those that see it in the forest back to their homes where it will kill the disturber in his sleep. They are widely believed to sing an eery song deep in forests looking for mates. They have killed entire villages. Or so the stories go. Though they can reach 3m long, legends of 4-5m snakes persist. The fact is this unique viper is a bit of a loner. They are docile if not disturbed and seem to rely on their mythological status when bothered to hold their own or majestically crawl away. If found during the day they are usually coiled resting, waiting for their mammalian prey to come to them. At night they may be on the crawl, head raised high, or coiled alert, poised to strike at a food source. This snake is rarely encountered and bites from it are rarer still. This snake has not earned the dangerous reputation that those in the genus Bothrops have rightly earned. Those snakes, the lance-heads, are common around humans, sometimes aggressive, quick to defend and bite, and cause numerous injurious bites and deaths. Bushmasters demand caution, respect, and a wary eye, but they are not to be feared. So why do I want to see this snake? Well, rarity is certainly part of it. I like to see things that few people have seen. I like that it is one of the top predators around, much like seeing a jaguar. I like that it is surrounded in myth and misunderstanding. I like the thrill of the hunt and that I can use the opportunity to educate. So that’s what happens when people ask me what snake am I looking for. I give a long answer and educate. And often times I get a longer dialog and hopefully leave some people with a better understanding of snakes. So this story has been repeated for over a decade. I’ve hiked hundreds of miles, many countries, countless nights alone and with others, searching for animals, always hoping that #1 on my wish list shows up. Of course, people tell me of their stories about how they saw a bushmaster their first trip into a forest. Or their friend found 2 on a 3-day tour. People that wouldn’t know a garter snake from a boa have seen them. But not me. My fate was determined elsewhere. Lachesis made sure that I would have to work for this goal. Along the way other snakes would remain more elusive and some would finally be seen. But the myth of Lachesis always grew. My friends and family all knew it. Javier, a Kichwa guide at Sani Lodge, Ecuador. A couple of years back now I was once again working at Sani Lodge in Ecuador. I had teamed up with my good friend Javier. Javier has a better eye for snakes than your average guide, but more importantly he has a better understanding. Javier knew that reptiles were misunderstood and had an important place in the forest. Javier is a Kichwa and grew up in the forest. 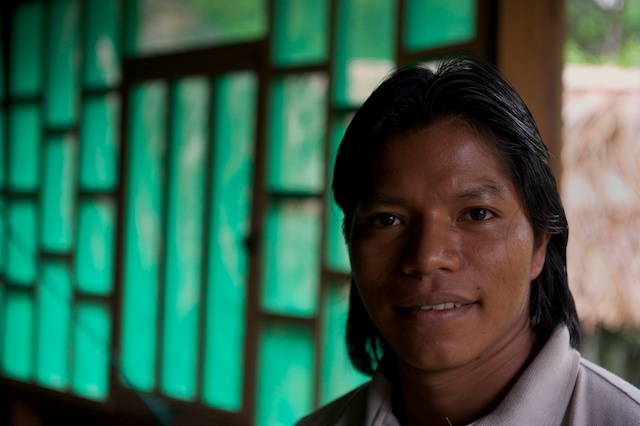 His family used to hunt and raise meager rations just across from Yasuni National Park. And despite a lifetime walking through this world he has only seen 3 shushupe – bushmasters. So Javier would always ask me questions about the biology of snakes. He learned as much as I could teach about their ecology and the different roles different species played. Of course, first taught was that not all snakes were venomous. And even those that were were often harmless when left alone. Considering that most forest peoples believe that all snakes are dangerous and best killed I could use my work to teach those that teach others. And thankfully the locals were perfectly willing to let this crazy snake man do his business. Sometimes, usually with a kid, I could even get some help. So on this particular trip we had been doing pretty good. Over the first week I had caught a number of snakes, including a few Bothrops, and Javier decided that we would do a long night hike. We would travel about 17km starting after dinner and returning at dawn. Bright red Drepanoides anomalous are relatively easy to spot at night. When they are around that is. Great story and photos, Tim! Congratulations on your bushmasters. What impressive animals they are! Brian, thank you very much sir. Amazing, Tim. Amazing and beautiful! Nicely done. Awesome story! I have done a great job of telling myself that I’ll never see one so I’m never disappointed when looking for snakes in the tropics hahaha.